Strong straight lines, with golden highlights accentuating the vertical movement, make this a favorite for women with a round, oval or heart face. 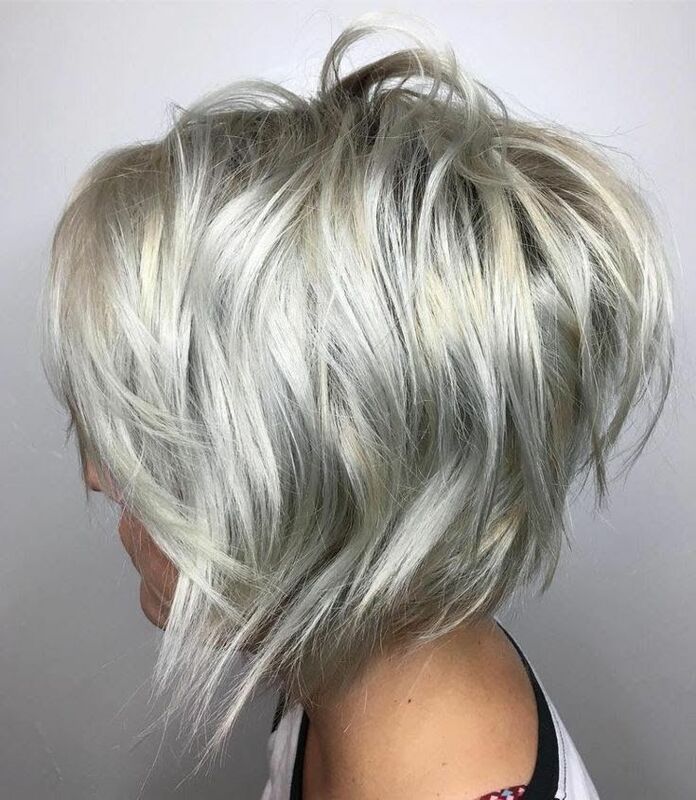 The back is teased to exaggerate the depth from front to back and the tips are heavily textured into sharp shapes to complete a highly fashionable look! 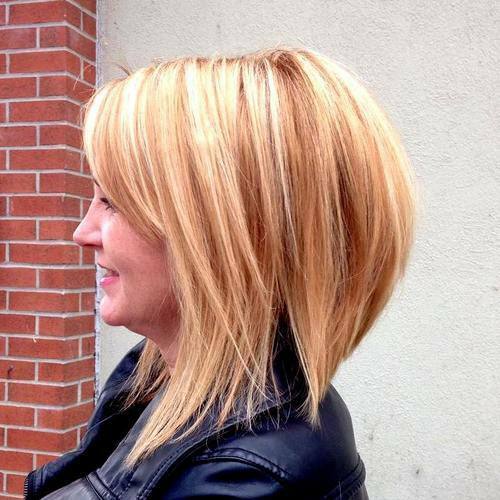 This fab angled bob has lots of the latest hair-fashion features creating a super-trendy image! The waves are random and edgy, with heavily textured tips for a ragged finish. 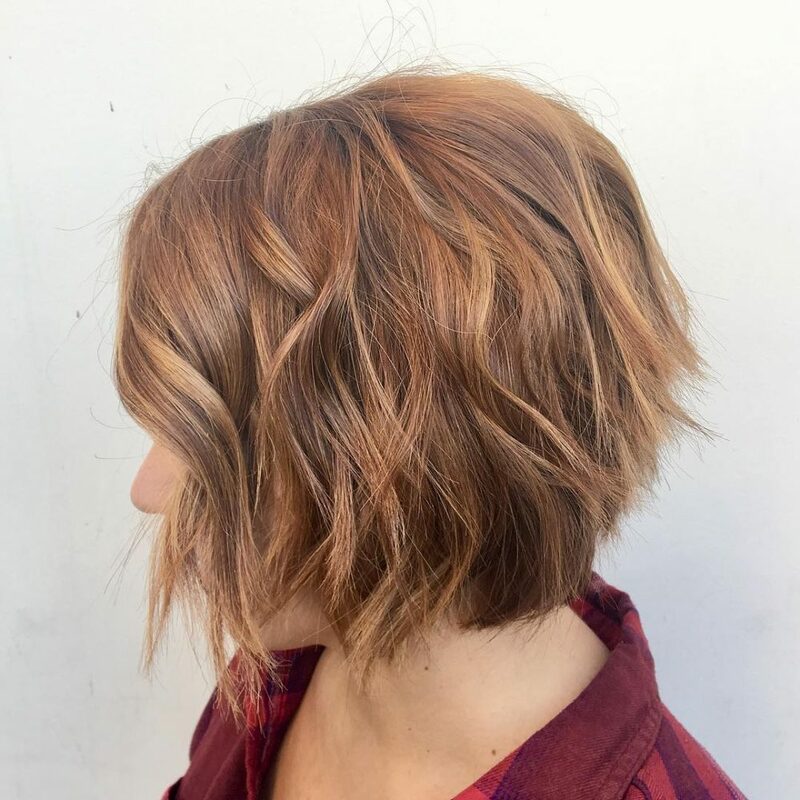 The color is dark-blonde, with medium gold highlighting, but there are also some ash-blonde touches near the tips breaking away from a ‘pretty’ look! 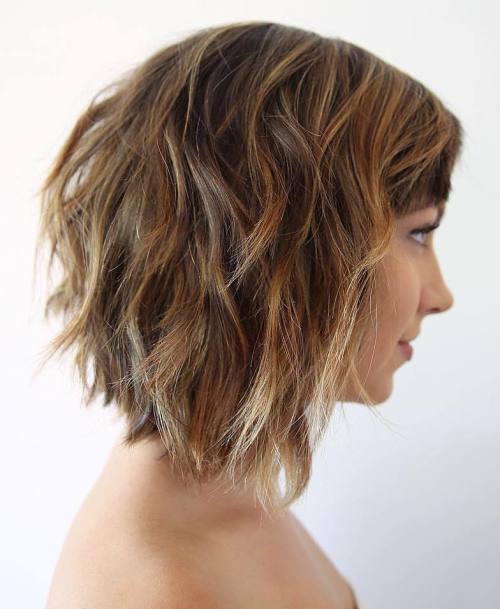 This is another easy-care, one-length bob that has fantastic texture and movement. The hair is trimmed in long layers, with close layers at the tips to create that lovely spiky look along the bottom edge. The deep straight across bangs suit round, oval, heart and long face shapes and there’s just a slight wave here and there! 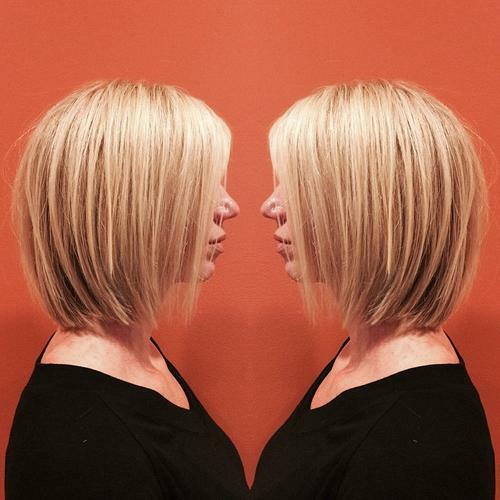 If your hair isn’t thick enough for a stacked-back bob, try this lovely A-line bob! It a great style for giving fine and medium hair the appearance of extra thickness and texture. 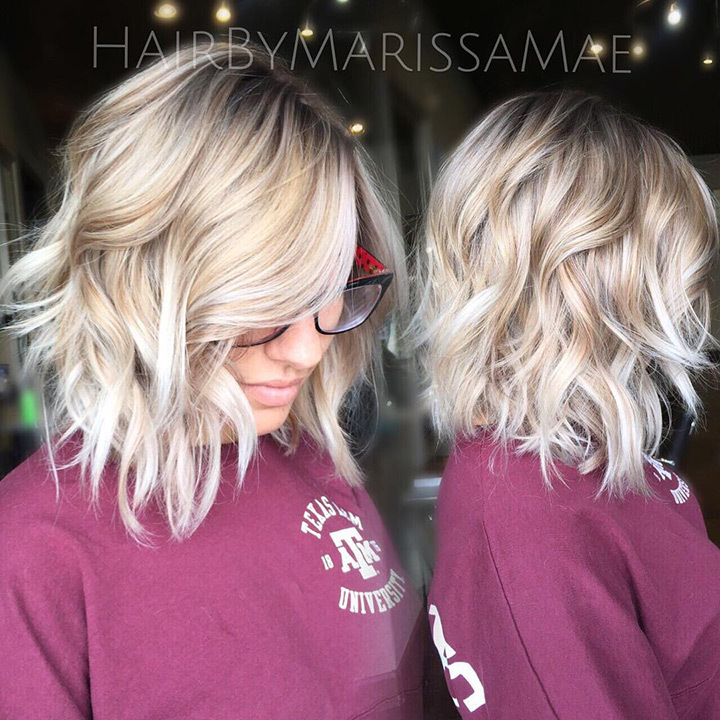 The pretty beige-blonde shades show it’s a contemporary look and the vertical highlighting creates lots of texture over blunt-cut tips. This is a hair-fashion-fusion style, which mixes wiggly flat waves with straightened, sharply textured tips for a modern, style-clash vibe! Underneath the textured top layers, there’s a cute aqua shade creating 3D effect to make hair appear denser. 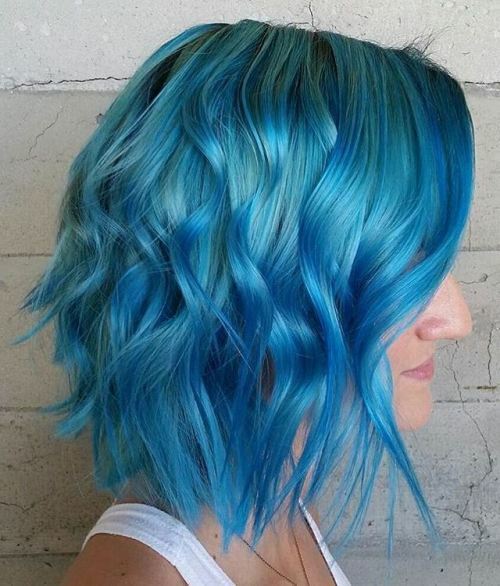 And the softly gleaming blue color and spiky tips make this choppy bob a fab summer hairstyle option! 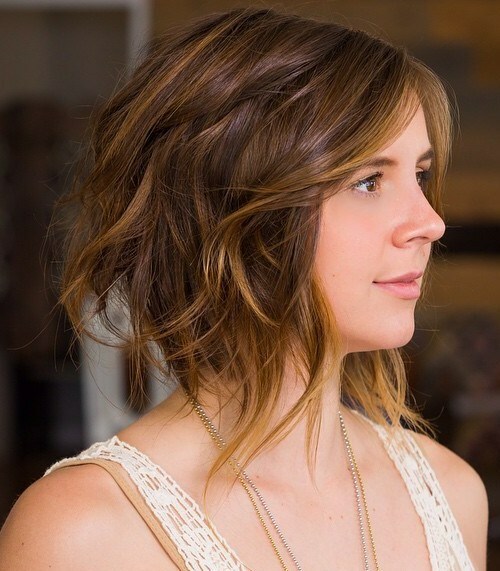 If your hair is thick, this is a great up-to-date hairstyle with a closely stack-cut layered back. The fantastic bump of volume at the back sweeps down in expertly graduated line to create a slight pin-curl at the front. The side-swept fringe drapes casually over one side of the face and the pale blonde over dark roots says ‘urban-chic’ loud and clear! Here’s a jaunty windswept look that makes a great daily hairstyle with plenty of contemporary style! 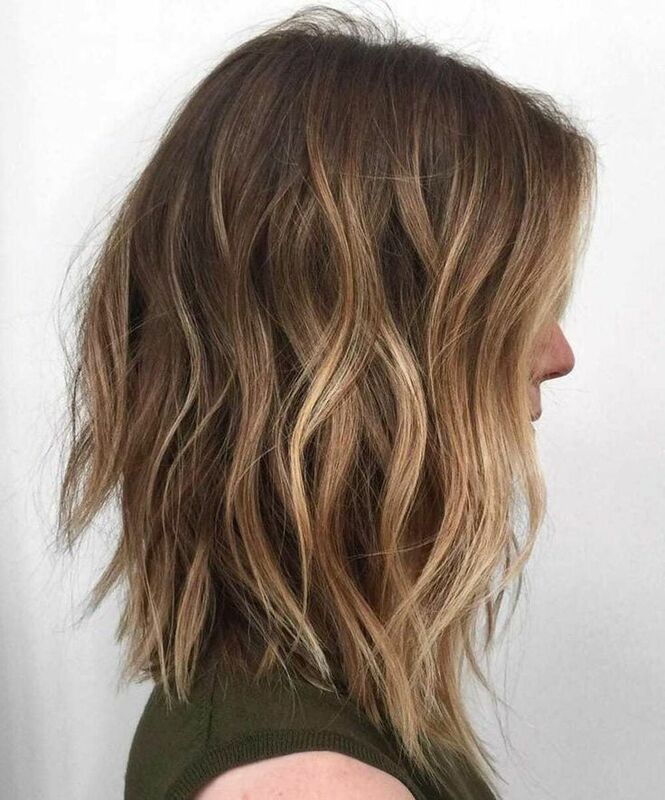 Hair is cut to fall at chin-length, which flatters most face shapes and the blend of neutral, beige-blonde highlights adds a denser look. With a little natural wave and a flattering side-swept fringe, this easy-care style suits fine and medium hair! This is a boho hairstyle to show-off your avant-garde style! 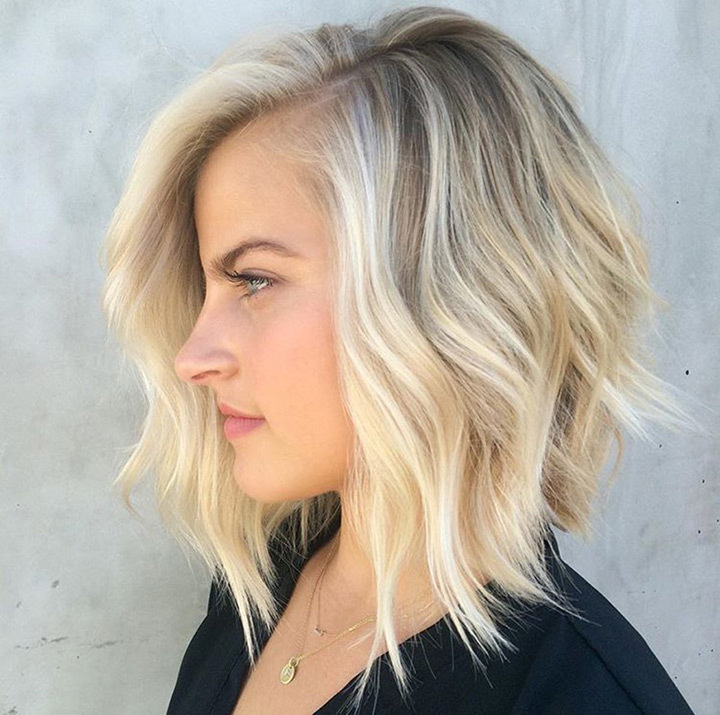 It can be achieved on medium and thick hair types with natural volume and when not styled to look messy, it’s still a fabulous white-blonde angled bob, with touches of gold balayage. The diagonal bangs and chin-length make this a good style for round, long, oval and heart faces! Get a new hairdo to go with your trendy, black leather jacket this season. 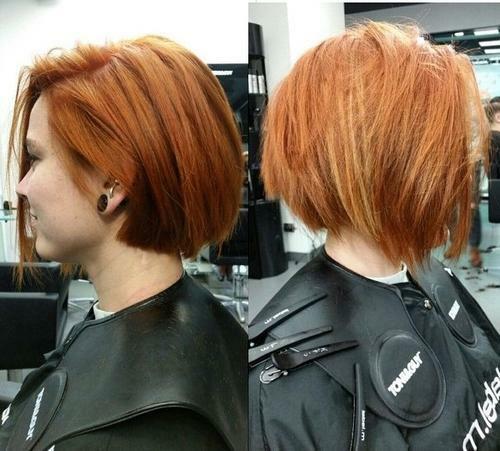 This vintage 60’s angled bob is brought right up to date with ginger and blonde vertical highlights. There’s teasing to get the bump of volume at the back and long, elongated sharp tips create a contrasting texture in this confident look! 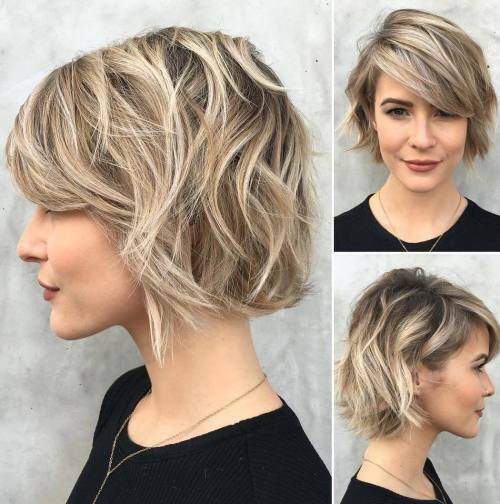 Short choppy bob haircut for women: This is another hot look with cool, beige-blonde dual-highlights creating loads of texture in the hair styled towards the front. 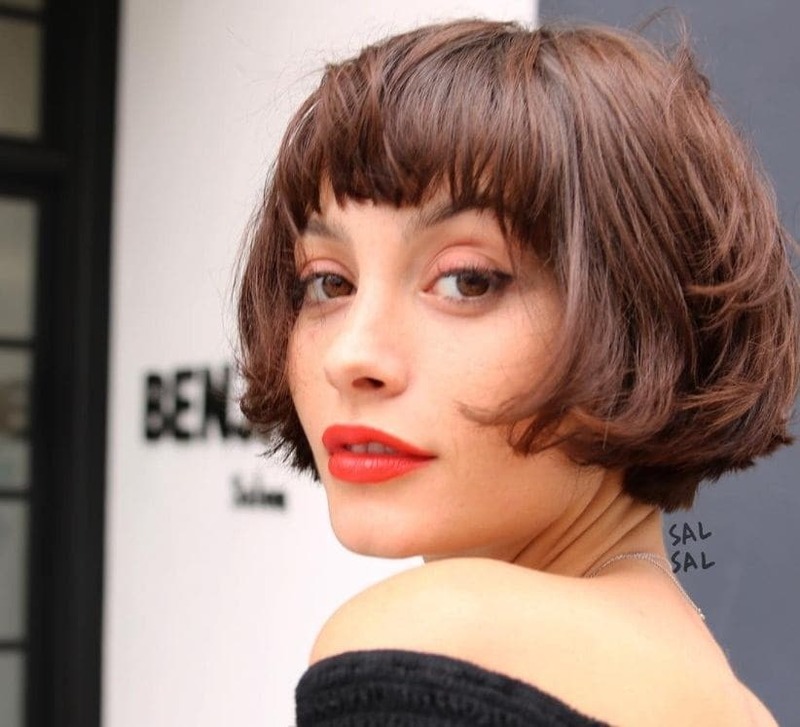 The extra-long bangs are swept sideways across the face, making this a good length of bob for round, long and heart faces. 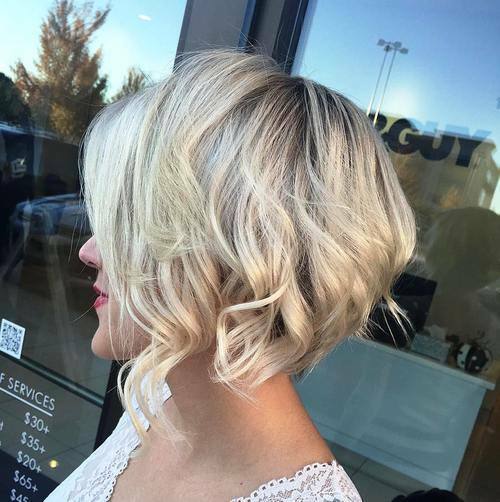 This medium angled bob has a fashionably steep graduation from the layered back down to wispy tips just touching the collar-bone. 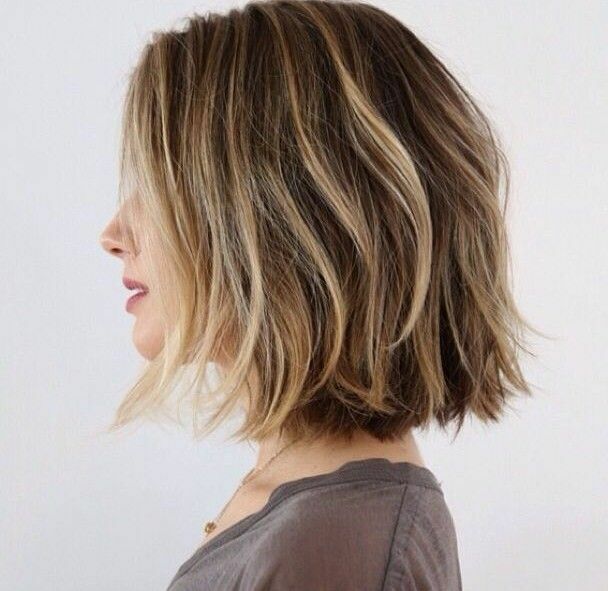 This is a bob you can achieve on most hair types, including fine hair, as tousled waves add volume and the subtle blonde highlights also create 3-D depth in the lower lengths. 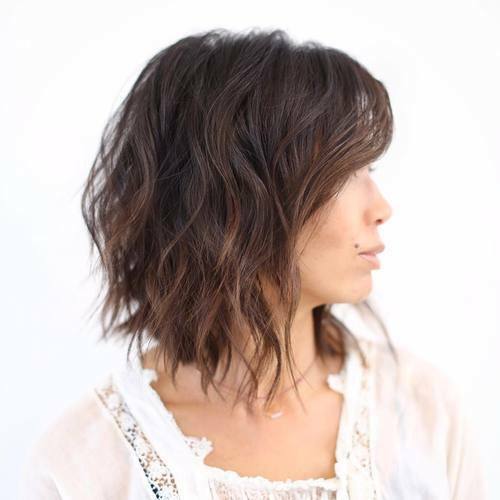 This messy bob has short layers on top (adding flattering height for round faces), long bangs and thinned sides ending in wispy tips. 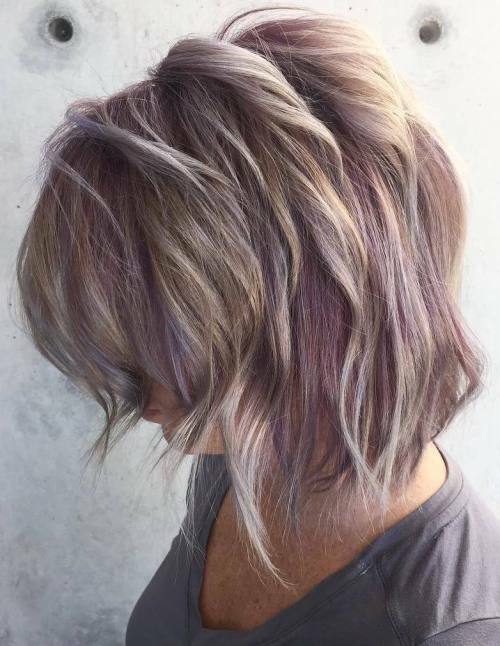 The trendy white-blonde highlighting accentuates top waves, soft lavender mingles with golden-blonde shades and the long, textured tips are silver-blue. Good cut for round, oval and heart faces. You can’t beat a touch of French style for creating a classy, chic and contemporary look. The hair is styled for a soft, casual look with gentle waves and gray/sea-green tones accentuating the curved lines. By contrast, the ends lightly textured to create a touch of spikiness. 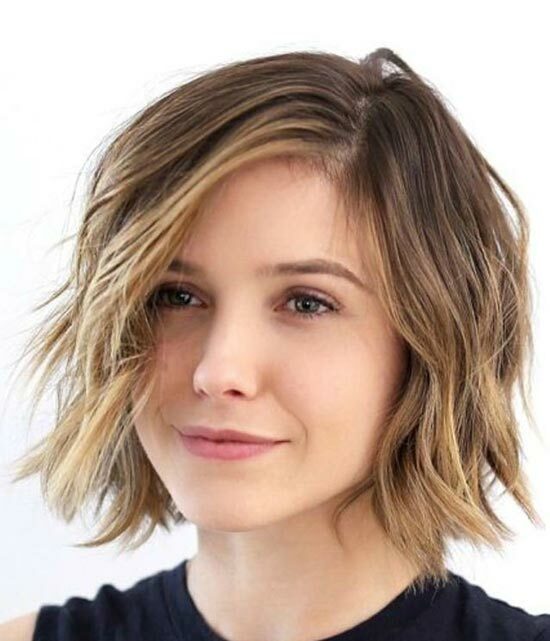 Great bob for long, heart, oval and round faces. 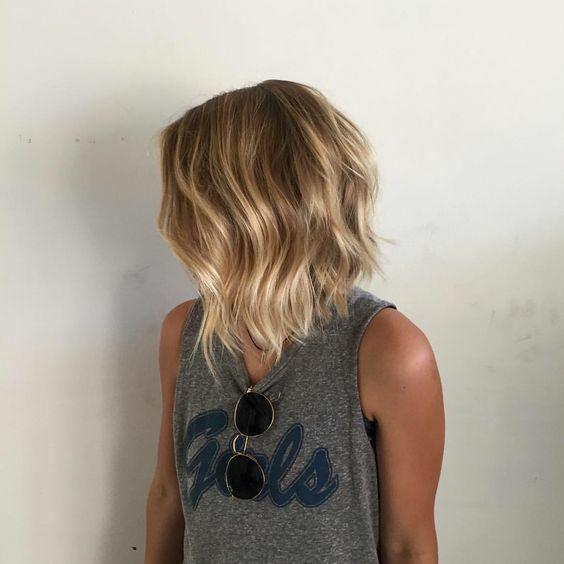 This pretty blonde angled bob has lovely curly texture around the back to soften the stacked-layers. 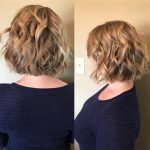 The loose twist waves at the sides meet the side-swept fringe in a flowing line that frames the face and head in a very feminine and attractive way! 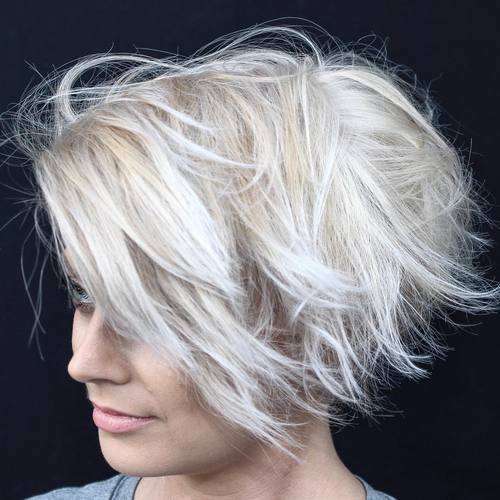 Fine white highlights add a pearly look to the pale blonde shade. 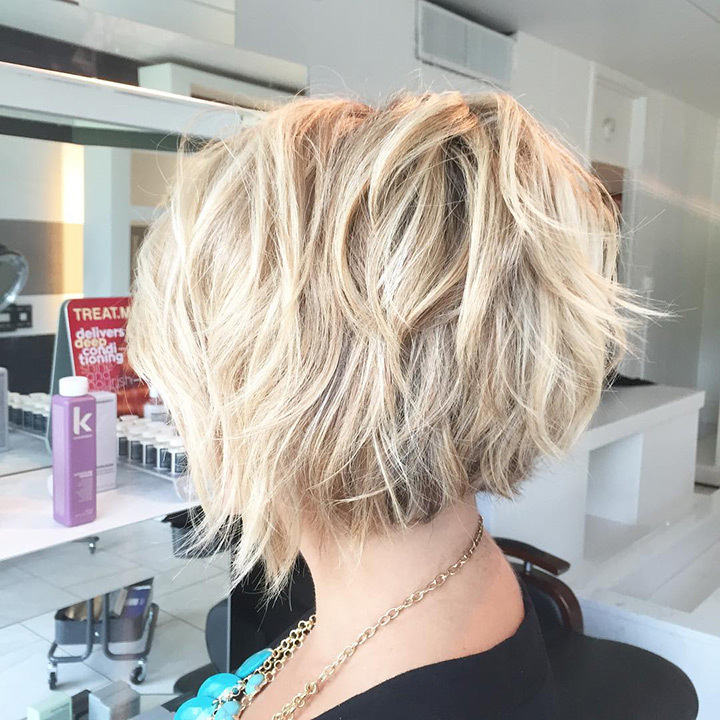 This bed-head bob haircut creates a youthful, carefree vibe on medium or fine hair in need of some extra volume. The parting is crooked, creating a casually draped long fringe over one side of the face and the ends are heavily textured to create super-fine, sharp tips. Teasing at the sides and back adds volume and shape to fine and medium hair. 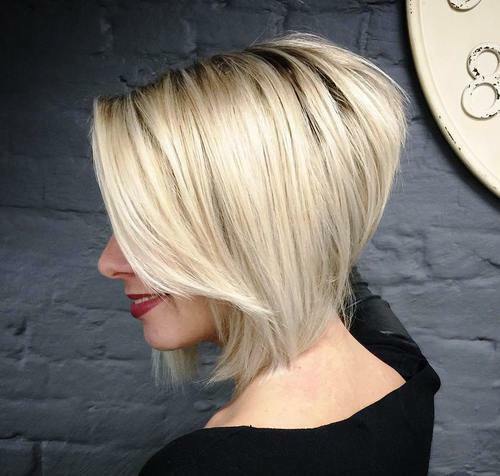 This versatile bob haircut can have a shaggy finish for leisure wear and a smoothly styled, professional look for work! Thick hair looks great with long, textured tips forming a tapered curved shape around the head. This trendy style suits long, heart and round faces and has a touch of height plus straight bangs with fine tips. 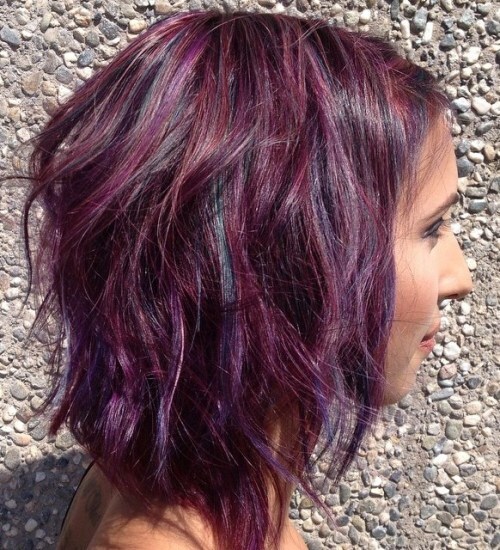 Darker skin-tones can wear this lovely plum and purple hair color design to create a summer (or winter) look that’s full of contemporary style! 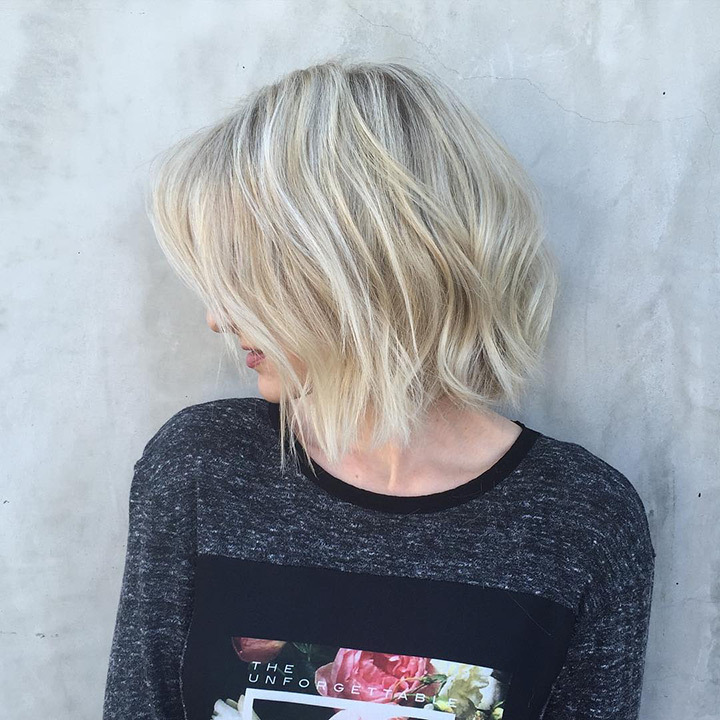 The medium bob has long layers and a tousled angle from back to front. 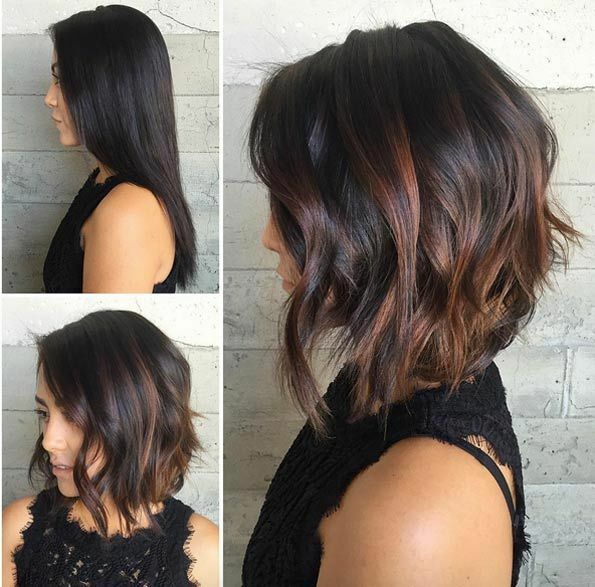 The styling is ‘messy’, making it an easy-care, medium bob that’s full of color, texture and lively movement! 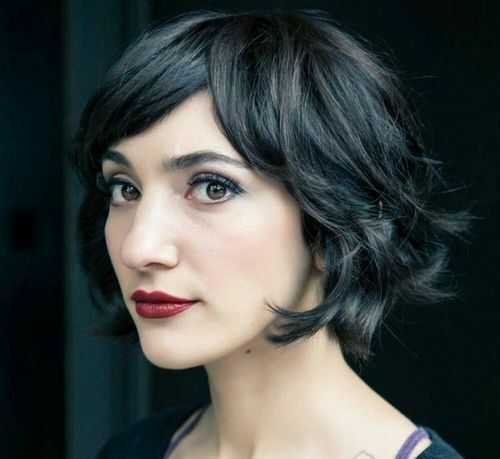 Pale skin-tones, with a warm undertone, look wonderful in copper face-framing bobs. This style has cute wavy volume in the graduated sides, above straight spiky tips. 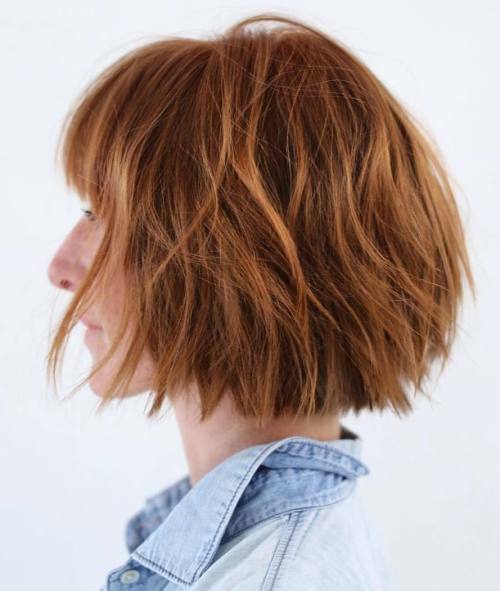 Long bangs draw attention to eye color and darker roots with bright orange highlighting, creates amazing color depth on a lively, youthful look! 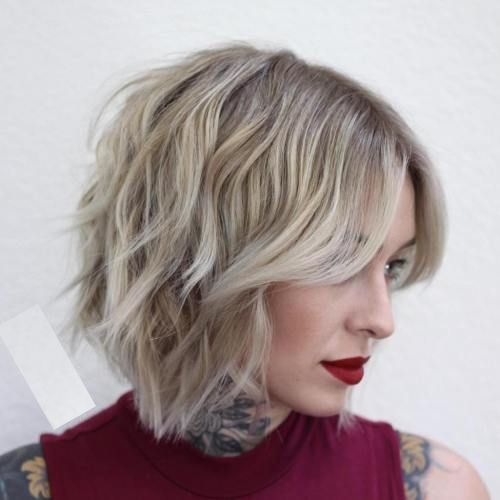 This edgy medium bob with disconnected, wispy layers is a slightly grunge look. 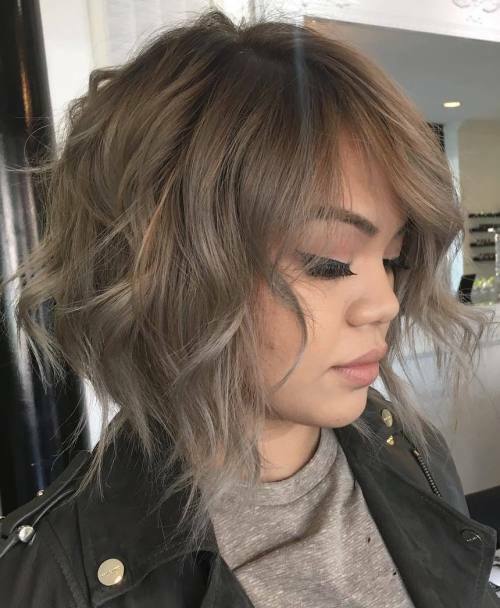 There’s a contrast between the delicate touches of gold-blonde balayage on the top and the silver-gray ombré accentuating the wispy, textured tips. The light-taupe shade between is the height of contemporary fashion and broken waves add volume on fine hair. 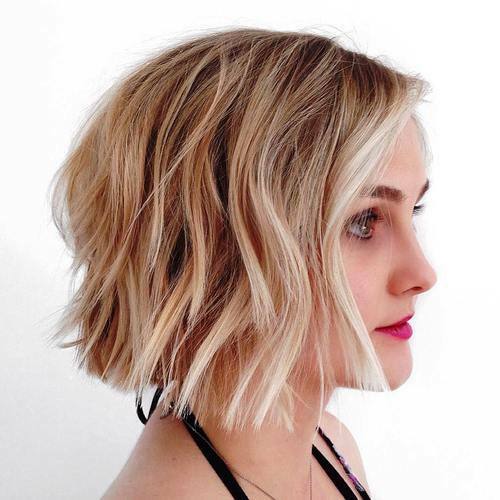 This trendy chin-length bob is a great way to get control of thick hair in an attractive every day style. The hair is only layered at the tips to create a lovely, rounded shaped that’s perfectly tapered into the nape. The side-parting creates an extra-long fringe and random yellow balayage adds a modern ‘cool’ vibe! 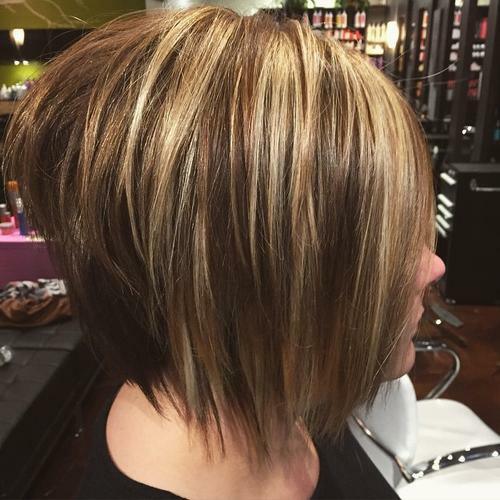 Here’s a very different bob haircut that’s a medium-bob with fabulously long wispy tips. 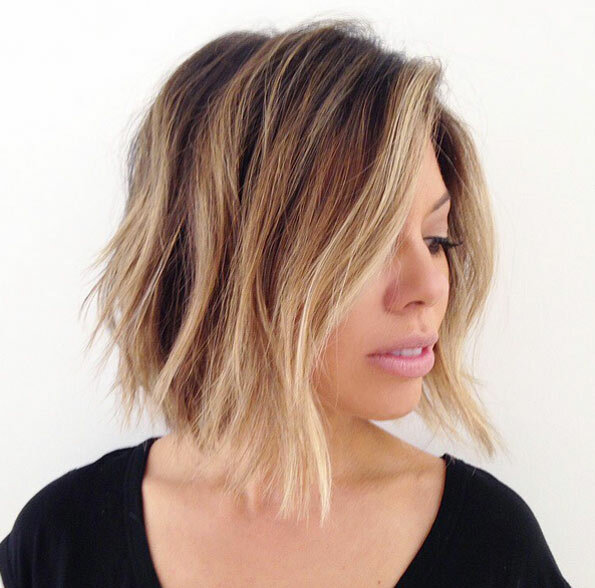 Fine or medium hair is cut in layers and tousled to create lots of cute, casual texture. On a light-brown base, unusual yellow-blonde highlights add the finishing touch to a youthful and attractive new look! 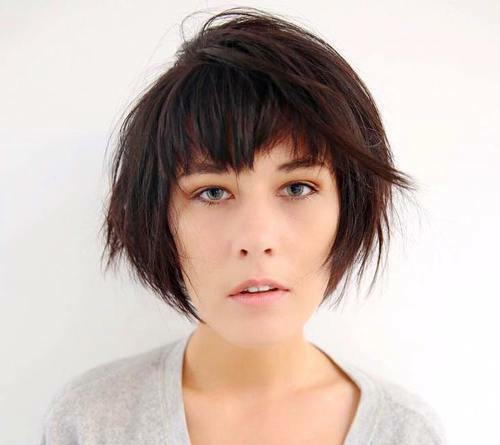 It’s amazing how much a choppy haircut can emphasize the prettiness of a face! 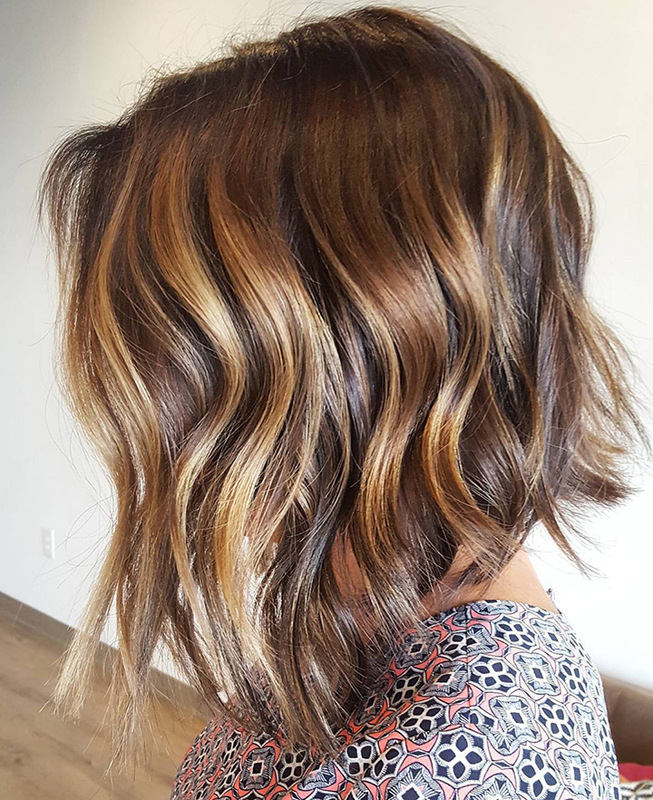 This totally up-to-date look has loose, flat waves in gold-blonde highlighted with trendy white touches over medium brown roots. The ends are textured for a ragged, uneven line that accentuates the model’s soft pretty features. 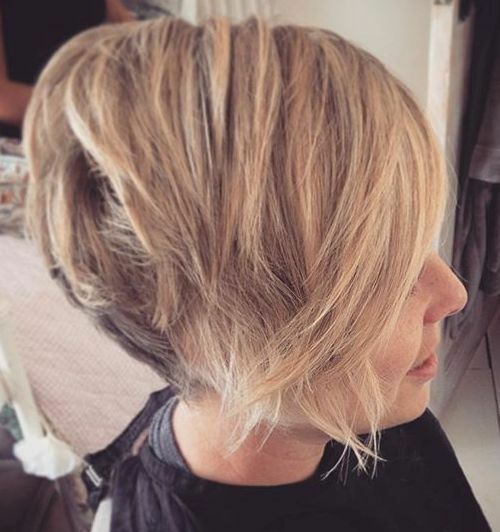 Choppy, shaggy and ‘windswept’ bobs are intended to break-away from the same old ideas about how we present ourselves and offer an alternative to mainstream looks! So don’t be afraid to try something completely different, in consultation with your stylist and colorist, and let your inner goddess have free rein!